THPBlog: Humboldt Redwood Company to log inside large tree marbled murrelet stand #351 SE of Eureka, CA. Humboldt Redwood Company to log inside large tree marbled murrelet stand #351 SE of Eureka, CA. This THP is about 9 miles SE of Eureka, CA and Highway 101 at an elevation of 1,200 to 1,800 feet. Humboldt Redwood Company is planning a tractor and cable logging operation on steep and unstable slopes in redwood, Douglas fir and grand fir forests. The THP area flows into the Elk River which is listed as an impaired watershed for sediment and siltation. There are 9 landslide terrain sites including fill failures, debris slides, cut bank failures and stream side failures. Humboldt Redwood Company is planning to use ground based equipment in areas designated for cable logging, and use ground based equipment on slopes over 50% grade that do not flatten before reaching a watercourse. They also are planning to construct a road near a wet area, use a seasonally wet landing, and construct a portion of the N88 road on steep slopes over 65%. 28 road drainage sites are planned for work including rocking, dip construction, ditch cleaning, culvert repair/replacement and restoration of washed out crossings. 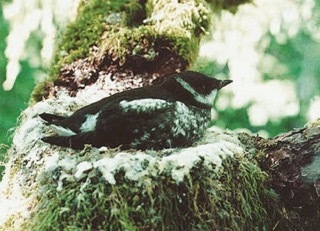 Logging is proposed inside large tree marbled murrelet stand # 351. There are over a dozen spotted owl nesting territories within 1.3 miles of the THP area.